A much-needed update to Bech's DayzCommander fork (original thread here: https://zombies.nu/community/threads/6537/). Fixes several important problems that were present in that version, such as requiring administrator permission, downloads only working on first check, clunky auto-update mechanism and Steam launch, and enables the DayZero team to better manage mod packages and installations. Control what version of beta is the "newest". Makes it easier for you to get your GUID as well as patch the mod content and Arma2 OA. Make it possible to only update changes instead of downloading the entire mod every time. You will probably find it looking awfully familiar, because we've built it by stripping the DayZ Commander Open Source project to what we needed. So thanks to DotJosh for creating DayZ Commander and for (initially) making the project available Open Source and Bech (Ron Swanson on the forums) for the hackery needed to get version 1.0 going with torrents and custom server lists. Server browser showing latency, player count, server type, and more. Automatically update your Arma2 OA Installation with the required beta patch. Ability to see and copy your GUID from the launcher. Custom launch parameters, windowed mode, and launch from Steam options (to preserve steam overlay). Ability to choose custom branch name and password for beta/testing participation and such. Easy installation with a single setup file or URL that requires no administrative privileges. The launcher is fully managed .net framework 4.0 code, with no way to edit system settings or files. If any virus scanner is reporting malware or 'suspicious software', it's doing it based on heuristics and giving a false positive. All released packages are digitally signed by Tansien to verify authenticity. Full GPL source code is available on my GitHub. [CHANGED] Major change to all updating and launching functions to accomodate new content system. [CHANGED] Switch deployment to use ClickOnce for per-user installs, automatic updating, ease-of-use. [NEW] Ability to change torrent client options such as DL/UL limits, max connections, listening port, and more. [NEW] Ability to change where the addons should be installed after they are downloaded and verified. [NEW] Ability to choose a development/testing branch in settings. 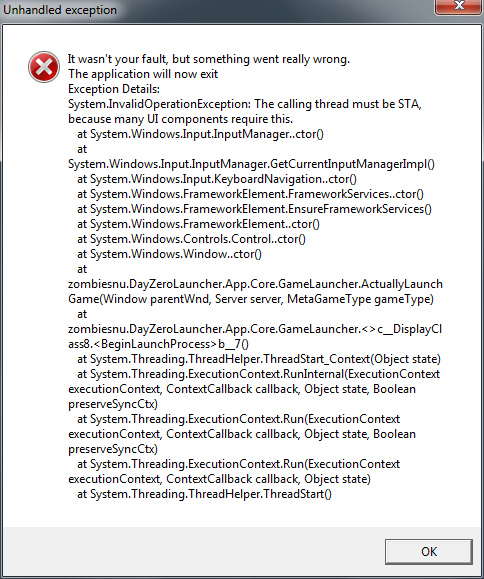 ( 1.2.2.12 ) [FIXED] Launcher crash when the 'Steam game not installed' dialog is supposed to show up. ( 1.2.2.13 ) [FIXED] Wrong beta version reporting when OA directory is overridden. [FIXED] It was possible to launch multiple instances of the launcher per-user before. [NEW] MOTD/Serverlist URL can now depend on the selected dev branch. [NEW] Support for URL parameters so you can directly launch a mod or join a server from the browser/shortcut. Why are there two addon folders? What's @DayZeroChernarus and @DayZeroPodagorsk? The separation of addons allows content to be different depending on game-type. It also shortens installation time since you are only launching one at a time. This might change back into a single @DayZero addon in the future, which shouldn't affect you. How do I launch without DayZero Launcher? You must install using the launcher (launch at least once) the game type you want to play. After that, you can launch Arma2 OA with the appropriate [email protected];... parameter like any other addon. My launcher opens in the taskbar but the window does not appear. It somehow got moved to another monitor or outside your normal desktop area somewhere. In windows explorer, go to the following folder: %APPDATA%/DayZeroLauncher/ and open settings.xml. Find <Left>SOME NUMBER</Left><Top>SOME NUMBER</Top> and set both to 0. Save settings.xml and then open the DayZero Launcher again. It should now be centered on your screen. The new content system no longer equates content download folder with mod installation folder. Because of that, after an upgrade from DayZero Launcher 1.0, the content download folder is empty. IF you don't want to redownload the same version you already have, move your existing installed addons (folders which begin with @, like @DayZero, @DayZeroChernarus, @DayZeroPodagorsk), which in version 1.0 had to be in the root of your ArmA2 OA installation directory, to the new content download folder, which is %LOCALAPPDATA%/DayZeroLauncher/content/data/ .If the download has already started, you will have to close DayZero Launcher before moving the addons, and after moving them, delete the fastresume cache files located in %LOCALAPPDATA%/DayZeroLauncher/torrent (file names begin with fastresume_). After that, you can do a Full System check and it will show the actual completion status. An animated demonstration can be viewed HERE. Go to https://launcher.zombies.nu and do what the yellow button says. Having the appropriate ClickOnce addon is not mandatory, but it will ensure the next step goes smoothly. If you followed the steps above, you should now have a fully functional DayZero Launcher version 1.2 or above. When i installed it again it says my dayzero install(1.1.7) is out of date and when i update it appears to download the whole mod... afaik there has not been released any patches tonight? Yes the auto-update in the old launcher is wonky which is why i posted the 'install msi manually' method first. This launcher will be required for the next major patch when it comes out. But why is it downloading 1.1.7 basically all over again when i start the launcher? i can play on the servers just fine using ingame browser. Read the FAQ in the first post. New launcher doesn't seem to acknowledge that I've installed the beta patch (103718, says I have 95248 ) and when I install it from the launcher it doesn't update itself. Prevents me from joining the servers via launcher. You are hitting enter ? Try double clicking. Fixed in 1.2.2.12, until Tansien pushes it go and install the 'Arma 2 Operation Arrowhead Beta' in Steam, which will workaround the crash. There is no '%LOCALAPPDATA%/DayZeroLauncher/content/data/' I get '%LOCALAPPDATA%/DayZeroLauncher/content/meta' is this the same thing? It's not. Make the 'data' folder if it's not there. Fixed in 1.2.2.13, until it's deployed don't check the 'Override' checkbox next to the OA directory in settings. Can't join any servers or launch the game since this update. This message pops up when I try.